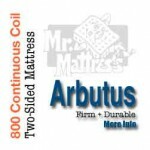 Arbutus Continuous Coil Mattress | Mr. Mattress is Vancouver's Mattress Store (Since 1964). Another one of our oldest mattresses in our best sellers lineup. Why? Because it is a super durable, really firm continuous coil mattress that lasts. Inside, it has 1″ of 2 lb density 95 compression foam with a fiber pad, a lumbar pad to support your back and 1″ quilting to a bamboo fabric. Same spec as our Platinum Firm mattress, just 1/2″ less foam.